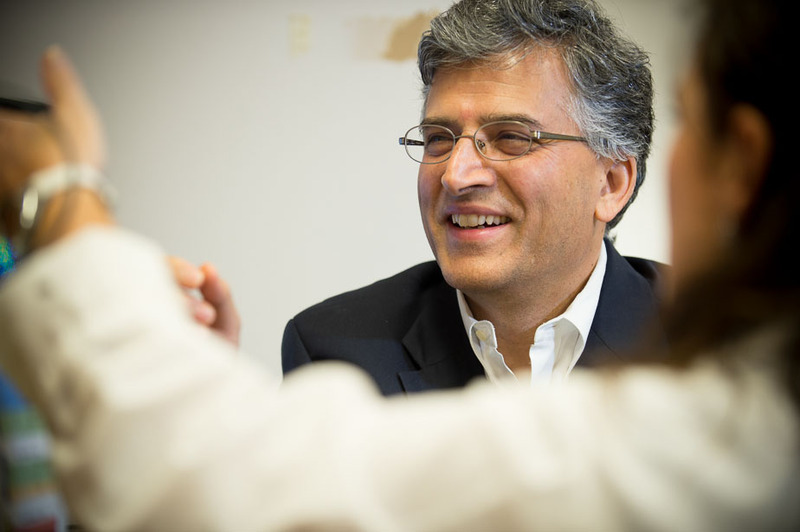 Dr. Vijay Kuchroo is the Samuel L. Wasserstrom Professor of Neurology at Harvard Medical School, Senior Scientist at Brigham and Women’s Hospital, and Co-Director of the Center for Infection and Immunity, at the Brigham Research Institutes, Boston. He is also an associate member of the Broad Institute, and a participant in a Klarman Cell Observatory project that focuses on T cell differentiation. He is the founding Director of the Evergrande Center for Immunologic Diseases at Harvard Medical School and Brigham and Women’s Hospital. His major research interests include autoimmune diseases—particularly the role of co-stimulation—the genetic basis of experimental autoimmune encephalomyelitis and multiple sclerosis, as well as cell surface molecules and regulatory factors that regulate the induction of T cell tolerance and dysfunction. His laboratory bred several transgenic mice that serve as animal models for human multiple sclerosis. The Kuchroo laboratory was also the first to describe the TIM family of genes, and identified Tim-3 as an inhibitory receptor expressed on T cells, which is now being exploited for cancer immunotherapy. He was first to describe the development of highly pathogenic Th17 cells, which have been shown to induce multiple different autoimmune diseases in humans. Dr. Kuchroo is the lead author on a paper describing the development of Th17, which is one of the most cited papers in the field of Immunology. Dr. Kuchroo came to the United States in 1985, as a Fogarty International Fellow at The National Institutes of Health, Bethesda, MD for one year, before joining the department of pathology at Harvard Medical School, as a research fellow. Later, he joined the Center for Neurologic Diseases at Brigham and Women’s Hospital as a junior faculty member in 1992. He obtained his degree in Veterinary Medicine from the College of Veterinary Medicine, Hisar, India. Subsequently, he specialized in pathology at the University of Queensland, Brisbane Australia, where he obtained a Ph.D. in 1985. He received the Fred Z. Eager Research Prize and medal for his Ph.D. research work at the University of Queensland. Based on his contributions, he was awarded the Javits Neuroscience Award by the National Institutes of Health in 2002 and the Ranbaxy prize in Medical Research from the Ranbaxy Science Foundation in 2011. He was named Distinguished Eberly Lecturer in 2014, and obtained a Nobel Laureate Peter Doherty Lecture/Prize in 2014. Dr. Kuchroo has 25 patents and has founded 5 different biotech companies including, CoStim Pharmaceuticals and Tempero Pharmaceuticals. He also serves on the scientific advisory boards and works in advisory capacity to a number of internationally recognized pharmaceutical companies including: Biocon, Syngene, Pfizer, Novartis and Glaxo-Smith-Klein (GSK).